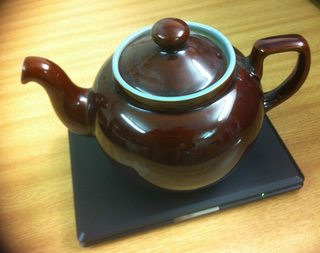 How do I get a static IP address for my teapot? It sits on a shelf in my office in the Computer Science department of a university and the support guys were kind enough to give it a dedicated IP address some years ago. My contract is coming to an end in the next few weeks and it's occurred to me that I'm going to have to do something with the teapot. I'd like to take it home but I have no clue how to explain to my home broadband supplier that I want a dedicated IP address coming to my house so that people can ping a teapot. Is there a reasonable way of having a server on a shelf in my house that people can ping via an IP address? What search terms can I use to find a solution to this problem? "explain to my home broadband supplier that I want a dedicated IP address coming to my house so that people can ping a teapot" just not reference the teapot... they could think you're crazy! By the way: just tell them you want a static ip address. Please Note that in many countries, many ISP don't sell static IPs to consumer-class customers (but asking them is free!). If they don't want to give you one, you can create a DynamicDNS account to allow people to reach the teapot using a hostname (e.g. : myteapot.dyndns.org). The word might just be "IPv6". It's entirely reasonable for a teapot to have an IPv6 address. The design of IPv6 allows you to have a whole subnet of IPv6 addresses for all devices in your home. Does it have to be an IP address? The reason I ask is that it would be much easier (and cheaper) to use a domain to access it. Doing this, you could maintain the same internet connection you have now at home, and use a service like dyn.com or noip.com to keep your domain (htcpcp.com maybe?) pointing to your home internet's dynamic IP. That way, when your modem reboots or your ISP changes the IP address you have, the domain will update to point to that. The other option would be to call up your ISP and just tell them you want a static IP address. Some ISPs will charge you around $5/month for this service, while others will require you to upgrade to a business connection before allowing you to do this. Is there a reasonable way of having a the server on a shelf in my house that people can ping via an IP addrees? Yes. See below. I assume by "ping" you really mean "contact using a web-browser" in order to receive an HTTP response code 418. What are the words I use to google for the solution to this problem? Home broadband is typically provided through a router that uses network address translation (NAT) where the internal network uses a private address range (e.g. 192.168.1.) and the external "public" address is dynamically allocated by the Internet Service Provider (ISP). Because it is dynamically allocated, it can change from time to time. Usually, when your home computers are turned on they broadcast a DHCP request asking for an internal IP-address they can use. Usually your router responds and allocates an address from a pool of internal addresses. The internal addresses typically can't be reached directly but your router uses NAT to translate between internal and external addresses. You need to ask for a "static IP-address". This means iyour public IP address will be fixed and can be published for use with your teapot. You won't get to choose the actual address. Some UK ISPs charge an extra monthly fee for this (e.g. BT) but some do not (e.g. Zen). Your Teapot might have a configurable fixed IP-address, in which case you should configure an address within the internal network range used by your router but outside the range handed out by your router - it's DHCP range. Alternatively you can configure your router to always give the teapot the same internal address. Incoming requests to your router, for teapot service, need to be passed on to the specific internal address of your teapot. You do this using "port forwarding". Some routers may refer to this as "pinholes" or use some other terminalogy. If your ISP isn't using carrier grade nat, you probably already have a pingable, global IP address. Some ISPs block ports, sure, and your IP address may not be static - changing occationally when you disconnect/reconnect. You simply check if you can get a second IP address routed to you (though I have no idea how a consumer grade router would handle this - you may need a commercial grade router) , or just get the teapot its own, cheap, line. If that's not an option a roundabout way might be to get a VPS with a static ip address elsewhere, and use your firewall to forward all the packets to said teapot. An alternative might be to have a proxy for your teapot handling these things. I suppose this may leave room for a virtual emulated teapot as well. The teapot's current IP address appears to be registered to RHUL. A single board computer should make an adequate home server for the teapot. Consider something like an OLinuXino, or see this helpful page from the Free Software Foundation. This way you won't have to give out your home IP and the device will essentially work as-is. On thing I haven't seen mentioned yet: Does it HAVE to be static? Absolutely? Positively? You can use a Dynamic DNS service to have your changing home IP address updated. http://dyn.com/dns/ is what I use for my home router, although I'm sure there are plenty other similar services out there. It might be more economical to have pay $25-35 a year... instead of what is more likely going to be ~$10 a month for a static IP address from your provider. The way DynamicDNS works is that periodically, you check your ip address. If it changes you update the DNS server. My router is setup to do it automatically with DynDns, although they happen to have an application that you can run on a local computer. Not the answer you're looking for? Browse other questions tagged networking webserver or ask your own question. Static IP Address with NetworkManager?